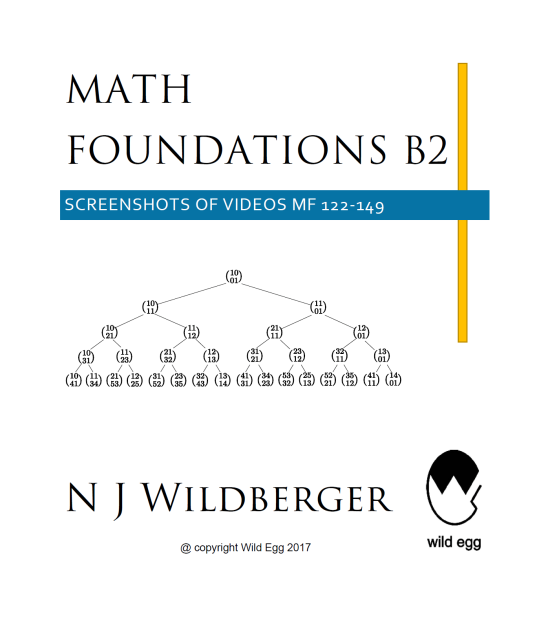 The Math Foundations series is probably the most important Playlist on NJW's Channel. Its aim is to encourage a shift in pure mathematics towards a more explicit, computational, and hence logical foundation. We want a mathematics unencumbered by philosophical theory, wishful thinking, appeals to authority, or rote allegiance to enshrined texts. We want people to actually understand and appreciate the logical structure of the subject directly, not from a distance or great height. 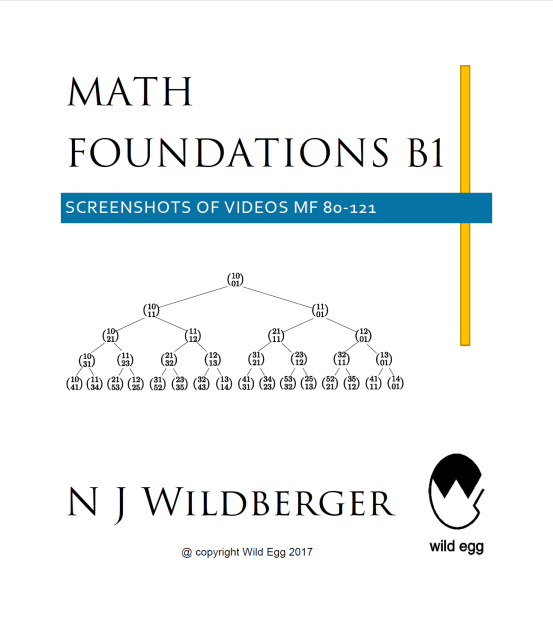 Currently we have more than 200 videos in the series, so we've organized it into smaller playlists, namely Math Foundations A, Math Foundations B and Math Foundations C. Here are the videos in Math Foundations B. All 70 videos are covered by two screenshot pdfs, which are available here at a very modest price. This video begins a discussion on the role of irrationality in mathematics, starting with the "square root of 2". The difficulties with this concept go back to the ancient Greeks, as the Pythagoreans realized that the side and diagonal of a square were incommensurable. The Greeks realized that there was no rational number whose square was exactly two, a result which historically appeared in Euclid. In the modern age this idea that there were "irrational numbers" that could be incorporated into the Hindu-Arabic decimal number system was introduced by Stevin in 1585. There are these days three approaches to "sqrt(2)": an applied one dealing with approximations, an algebraic one involving a finite field extension of the rational numbers, and an analytic one which attempts to apply the square root algorithm to assign to sqrt(2) an infinite decimal. It is this last approach which does not work, leading to serious logical problems with modern analysis. For those interested in this topic, be sure to watch the further videos in this series which go into considerable detail about the various problems with real numbers as infinite decimals, equivalence classes of Cauchy sequences, and Dedekind cuts. None of them work. Those who are interested in the topic of this video might also like the four videos FMP19, FMP19b, FMP19c and especially FMP19d. This video introduces interval arithmetic, first in the context of natural numbers, and then for integers. We start with some remarks from the previous video on the difficulties with irrational numbers, sqrt(2), pi and e.
Then we give some general results about order (less than, greater than) for natural numbers and recall the constructions of integers and rational numbers from natural numbers. We introduce intervals for natural numbers and discuss various interpretations, and explain how to do arithmetic with them. The video ends with some interesting challenges to figure out how to extend this arithmetic to the case of integral intervals. We continue on with a short intro to interval arithmetic, noting the difference between the laws of arithmetic over the natural numbers and the integers. The case of rational number intervals is also briefly discussed. We end the lecture with some remarks on the vagueness of ``real number'' arithmetic. Newton, the towering scientific figure of the 17th century, discovered a lovely method for finding approximate solutions to equations, involving iterated constructions of tangent lines and their intersections. We describe this method in general and then apply it to the simplest and most familiar example; the standard quadratic polynomial x^2. To calculate tangent lines we use the algebraic calculus, and focus on approximating sqrt(2). This gives, remarkably, the same algorithm as the ancient Babylonians had for approximating sqrt(2), and so another alternative to the Vedic procedure. A one page summary of the contents of K-12 mathematics is followed by some basic principles that may be useful in mathematics education. For example---calculators are unnecessary. After that, some tips on how the foundations so far on arithmetic with natural numbers can guide primary school education. This lecture is part of the MathFoundations series, which tries to lay out proper foundations for mathematics, and will not shy away from discussing the serious logical difficulties entwined in modern pure mathematics. This foundational talk introduces the most important development in the history of mathematics and science--the Hindu-Arabic number system. To motivate it, we start by reviewing natural numbers as strings of ones, then introduce the Roman numerals in a simplified form, then the Hindu-Arabic system. Newton's method can be extended to meets of algebraic curves. We show how, using the examples of the Fermat curve and the Lemniscate of Bernoulli. We start by finding the Taylor expansions of the associated polynomials (polynumbers) at a fixed point (r,s) in the plane. The first tangents are viewed as tangent planes to the associated surfaces in three dimensional space (Interpretation B in the language of MF78). This is a more advanced lecture. After this, we will turn our attention to the logical weaknesses of modern pure mathematics--of which there are many! We give some initial orientation to the first two claims, suggesting that contrary to popular opinion, rigour in mathematics has been on a consistent downward trend in the last few centuries, and give an explicit list of problematic definitions, cutting across many areas of modern pure mathematics. In subsequent videos in this series, we will be substantiating the claims made here. We will also be inviting comments and a wide discussion of these highly contentious, but vitally important, issues. ​Rigour means logical validity or accuracy. In this lecture we look at this concept in some detail, describe the important role of Euclid's Elements, talk about proof, and examine a useful diagram suggesting the hierarchy of mathematics. We give some explanation for why rigour has declined during the 20th century (there are other reasons too, that we will discuss later in this course). Critical in this picture is the existence of key problematic topics at the high school / beginning undergrad level, which form a major obstacle to the logical consistent development of mathematics. We list some of these topics explicitly, and they will play a major role in subsequent videos in this series. We introduce some basic orientation towards the difficulties with real numbers. In particular the differences between computable and uncomputable irrational numbers is significant. Then we discuss the relation between fractions and repeating decimals, giving the algorithms for converting back and forth, familiar from high school. The operations of addition and multiplication for repeating decimals are more subtle, and involve some lovely number theoretical aspects. The current theory of `real numbers' is logically deeply flawed. Essentially this theory is awol---everyone refers to it, but no one can tell us where it it is actually written down properly and completely. We are moving here towards the realization that mathematics is really about rational numbers, and theories that can be built from them in a finite and completely precise way. Hello future mathematics! This video is an exploratory video in which we loosely introduce an interesting variant on repeating decimals: namely 10-adic numbers, or repeating reversimals (this is our own name). These are decimal-like objects whose digits carry on to the left, rather than the right, but still in a periodical fashion. Surprisingly, the arithmetic with these "repeating reversimals" parallels that of repeating decimals, but is generally simpler, due to the way that carrying works in the Hindu-Arabic framework (namely it proceeds to the left). We look at addition, multiplication, negatives and converting fractions to reversimals and back again. This is not at all a rigorous lecture, but just introduces a playful, yet curiously powerful, alternative to arithmetic with decimal numbers. It is a fun topic to explore if you have an interest in number theory or just patterns with numbers. There are three quite different approaches to the idea of a real number as an infinite decimal. In this lecture we look carefully at the first and most popular idea: that an infinite decimal can be defined in terms of an infinite sequence of digits appearing to the right of a decimal point, each digit chosen arbitrarily and independently. There are several very attractive reasons for taking this position, which we outline. Primary among these is that the definition allows us to turn a process into a number (ostensibly!). But ultimately the idea founders on the rocks of reality: the impossibility of specifiying competely a general such number, the impossibility of defining the addition (and multiplication) of such numbers via finite algorithms, and the resulting problematic aspects of the laws of arithmetic. We look also briefly at the role of the Axiom of Choice in trying to provide an axiomatic framework for real numbers as such `infinite choice decimals'. This lecture introduces some painful realities which cast a long shadow over the foundations of modern analysis. We study the problem of trying to define real numbers via infinite decimals from an algorithmic/constructive/computational point of view. There are many advantages of trying to do this: historically this was the point of view towards decimals like sqrt(2) or pi or e, and this provides us with tools to define and evaluate infinite series, functions and integrals. However in reality the idea bumps against seemingly unsurmountable technical obstacles: the difficulties in defining algorithms and implementing arithmetical operations at this level, non-uniqueness of algorithms and corresponding ambiguity in recognizing equality of real numbers, and a vagueness or tautological aspect to arithmetic with these objects. Math Foundations 93: The magic and mystery of "pi"
The number "pi" has been a fascinating object for thousands of years. Intimately connected with a circle, it is not an easy object to get hold of completely rigourously. In fact the two main theorems associated to it--the formulas for the area and circumference of a circle of radius pi--are usually simply assumed to be true, on the basis of some rather loose geometrical arguments in high school which are rarely carefully spelt out. Here we give an introduction to some historically important formulas for pi, going back to Archimedes, Tsu Chung-Chi, Madhava, Viete, Wallis, Newton, Euler, Gauss and Legendre, Ramanujan, the Chudnovsky brothers and S. Plouffe, and culminating in the modern record of ten trillion digits of Yee and Kondo. And I also throw in a formula of my own, obtained from applying Rational Trigonometry to Archimedes' inscribed regular polygons. It should be emphasized that the formulas here presented are not ones that can easily be rigorously justified, relying as they do on a prior theory of real numbers and often Euclidean geometry. The lecture ends with some speculations about the future role that "pi" might play in our understanding of the continuum--a huge problem which is not properly appreciated today. ​One of the standard ways of trying to establish `real numbers' is as Cauchy sequences of rational numbers, or rather as equivalence classes of such. In the next few videos we will be discussing why this attempt does NOT in fact work! In this lecture we provide an introduction to these ideas in an informal and descriptive way. In particular we visualize sequences of points in the plane, and discuss two different notions of when two sequences converge; including Cauchy convergence. We also outline the challenges that lie in wait for anyone who tries to set up arithmetic with `real numbers' in this way. It is not a surprise that this is nowhere properly done, although many students are under the mistaken impression that they have `covered' this material at some point in their analysis courses. The rational numbers deserve a lot of attention, as they are the heart of mathematics. I am hopeful that modern mathematics will (slowly) swing around to the crucial realization that a lot of things which are currently framed in terms of "real numbers" are more properly understood in terms of the rationals-- in which case richer number theoretical/combinatorial aspects start to become more visible. After a review of basic definitions including the idea of average and mediant of two rational numbers, we focus on the interval [0,1], and discuss how convex combinations allow us to match up any two intervals. We introduce the idea of the level of a rational number, and the famous Farey sequences. These are connected with the notion of Ford circles which we talked about in MF14. A key principle is that even in [0,1], the uniformity of the rational numbers is an illusion; rather they are a layered strata which we can delve into deeper and deeper, yielding more and more complicated numbers. The layered structure of the rationals will play an important role when we start to discuss sequences of rational numbers in a few more videos. Here we introduce the Stern-Brocot tree, a remarkable representation of fractions by means of a binary tree, discovered around 1860 by a German mathematician and French clockmaker. The mediant operation is used to generate the tree. We describe a number of pleasant properties of the tree, including one discovered by a Canadian musical theorist, Pierre Lamothe. We also connect the Stern-Brocot tree with the Ford circles discussed in the last video as well as MF14, and the Farey sequences. This is a good example of the deep structure of the rational numbers! We discuss further manifestations of the Stern-Brocot tree, which we discussed in the previous lecture. Here we introduce the matrix form of the tree, which sheds new light on how to move smoothly down the tree. To do this we introduce some basic definitions on 2x2 matrices and their determinants, including the operations of addition and multiplication, and the three special matrices I,L and K.
Then we exhibit a somewhat novel planar, geometrical representation of the Stern-Brocot tree, identifying fractions with visible integral points in the positive quadrant. This gives an explanation of the curious role of the pseudo-fraction 1/0 which we used in the last lecture to generate the tree. Finally we introduce a new geometrical structure that results from combining the matrix and geometrical forms of the Stern-Brocot tree; the theory of wedges. A wedge is a particular triangle associated to a fraction, or to a matrix in the matrix form of the S-B tree, and these provide a curious tesselation of the visible positive quadrant, rather challenging to visualize! Math Foundations ​98: What exactly is a sequence? The term `sequence' is so familiar from daily life that it is easy to dismiss the need for a precise mathematical definition. In this lecture we start by looking at finite sequences, of a particularly pleasant kind, namely sequences of natural numbers. The distinction between the specification of such a sequence and a description of it is emphasized. We must also maintain some respect for sequences that get large---ultimately they can have qualitatively quite different properties. We also mention N. Sloane's On-line Encyclopedia of Integer Sequences, a valuable resource for mathematically minded people. Math Foundations 99: "Infinite sequences": what are they? This lecture tries to clarify the big gap between the (finite) sequences we introduced in the last lecture, and "infinite" or "ongoing sequences" (we introduce the term "on-sequence") as are found in Sloane's Online Encyclopedia of Integer Sequences. We concentrate discussion on three such: the basic on-sequence of natural numbers, the on-sequence of prime numbers, and the on-sequence of Catalan numbers. We lay out Euclid's well-known proof that given any finite list of primes we can find a prime not in it, and suggest some computational snags that perhaps we might worry about. The Catalan sequence of combinatorics fame has many possible definitions and formulas, illustrating the crucial distinction: finite sequences are specified by the elements of the sequence themselves, while "on-sequences'' can only be specified more indirectly, and generally non-uniquely. Along the way we point out that the grammatical closeness of the terms finite and infinite suggest a dichotomy which is not really born out in experience. While finite sequences are specified by listing all elements, this approach does not work for "infinite sequences" which carry on indefinitely. We prefer the more modest term of 'on-sequence', and stress the importance of building up such a theory one step at a time. This lecture begins such a theory by first defining constant on-sequences, which turn out to be finite expressions such as [3) (actually a pointy right bracket) with the possibility of an index to define the m-th element, all of which are 3 in this case. The arithmetic of such constant on-sequences parallels, in an obvious way, the arithmetic of natural numbers. The next step is to define polynumber (or polynomial) on-sequences. We will use the letter n here to characterize such objects, for example the on-sequence [n), enclosed in a square and a pointed bracket, is the basic natural number sequence which we usually would write 1,2,3,.... Again the arithmetic of such polynumber on-sequences parallels that of polynumbers. We give some examples of particular polynumber on-sequences that arise in Sloane's Online Encyclopedia of Integer Sequences (OEIS). In particular we have a look at the frog-and-toad-hopping-interchange sequence :). Is there a convenient way to access all of the polynumber on-sequences in OEIS?? In our last video we introduced polynumber (or polynomial) on-sequences. Today we consider how we might go beyond this, to introduce a wider range of sequences, to deal with more of the examples in OEIS, for example. The first attempt will involve 'exponomials": arithmetical expressions extending polynomials by allowing also exponentials, such as n^n for example. While tempting, this extension is rather problematic logically, and I explain why. Another important kind of object in this area are "recursive sequences". There are many familiar examples of such; primarily the Fibonacci numbers 1,1,2,3,5,8,13,21,... or the closely related Lucase numbers 1,2,4,7,11,18,29,...In OEIS we find many more recursively defined sequences, such as the Catalan numbers, or the Euler numbers (also called Slyvester's sequence). But what exactly is the definition of a ``recursive sequence"?? This is an embarrassing question for many mathematicians, who naively regard the term as almost self-evident, or at least only requiring a few examples and a bit of hand-waving. No, no, no! The idea is far from clear. Conclusion: without a lot of work, neither exponomials or general recursive on-sequences are available to us at this point. More work needs to be done first! In our next video we will move to a much more solid extension of polynumber on-sequences. We introduce more general ``infinite sequences'', or on-sequences, generated by rational polynumbers, otherwise often known as rational functions: ratios of one polynomial over another. The association of a sequence to such an expression is surprisingly delicate, and requires us to look at factorizations. In particular we are naturally led to introduce a new symbol for ``infinity", corresponding to a ratio of integers with zero in the denominator, and associated with a limiting behaviour getting larger and larger as we approach a particular value. Math Foundations 103: Extending arithmetic to infinity! We are interested in investigating how to rigorously and carefully extend arithmetic with rational numbers to a wider domain involving the symbol 1/0, represented by a ``sideways 8''. First we have a look at the simpler case of natural number arithmetic, where extending to infinity is relatively simple. For the rational number case, which is quite separate from the natural number case, we look to connect arithmetic with the geometry of the plane, and the projective geometry of lines through the origin. Our strategy is to focus on integral points [a,b] in the plane, and define suitable notions of rational addition and rational multiplication of these. By associating to the integral point [a,b], where b is not zero, the rational number a/b, we can make rational number arithmetic follow from arithmetic with integral points. In this way, the point [1,0] plays a role analogous to infinity. This connects also with earlier videos on the Stern-Brocot tree. We systematically introduce the four arithmetical operations on integral points of the plane, state some of the main arithmetical laws satisfied, and then show how to obtain the extended rational numbers by suitably identitying integer points, in a similar way to the introduction of rational numbers. Notably this allows a uniform and completely unambiguous introduction of 1/0 into arithmetic. Everything is motivated by projective geometry--the idea that a line through the origin in two dimensional space can be specified by homogenous coordinates, and more or less gives us an extended rational number. However we must pay a price: the admission of the strange new object 0/0, which is separate from all the other extended rationals, and plays a curious but central role. I also suggest a contest: what is a good name for this object 0/0?? Dear Viewers-- After pondering our notational challenge, I am leaning towards one of the first suggestions, made by teavea10: that 0/0 by called ``zoz'', short for ``zero over zero''. Can anyone think of any compelling reason to not adopt this somewhat novel but appealing nomenclature?? The extended rational numbers also naturally arise in projective geometry, particularly the one dimensional projective line, which may be viewed as an affine line with one point (infinity) attached at both ends, or, as Mobius and Plucker realized, as the space of lines through the origin in a two dimensional affine space. This naturally connects with our earlier picture of extended rationals as arising from grouping integer points together into teams, along lines. Finally we show that the extended rationals can be used to parametrize a circle, or more general conic, as long as it passes through the origin. In fact we have seen this parametrization before (with axes interchanged!) but now infinity can be also used to close up and unify the parametrization. I end with two very interesting challenges: how to geometrically describe addition and multiplication on points on the circle. Math Foundations 106: What exactly is a limit?? In this video we aim to give a precise and simpler definition for what it means to say that: a rational polynumber on-sequence p(n) has a limit A, for some rational number A. Our definition is both much simpler and more logical than the usual epsilon -delta definition found in calculus texts. What is required is that we need to find two natural numbers: k called the scale, and m called the start that allow us to bound in a pretty simple way the difference between p(n) and A. The epsilon-delta definition of a limit is usually considered a high point of logical rigour. Not so. It is also considered too logically involving to be taken seriously as a pedagogical pillar for most undergrads. Hence students may be told about the definition, but are not required to seriously understand it, or be able to use it--unless they are prospective maths majors. There is a subtle ambiguity in the definition: given an epsilon we are supposed to demonstrate there is a delta (with certain properties) but how are we to do this, since a potential infinity of epsilons are involved? In practice what is required is a correspondence (function/relation etc) between epsilon and delta but the nature of this required correspondence is not clear. We return to our familiar conundrum of using the work``function'' without a proper definition of it. The key point that makes our simpler more intuitive notion of limit of a sequence work is that we are dealing with very particular and clearly defined on-sequences: those generated by a rationl polynumber. A good example of the benefits of being careful rather than casual when dealing with the foundations of analysis! The epsilon-delta definition of a limit of a sequence, going back to Cauchy and Weierstrass, is here dramatically simplified by restricting attention to the basic objects of calculus: rational polynumbers (or ``rational functions''). We review the basic definition and give a visual interpretation: instead of an infinite number of nested epsilon neighborhoods, we have a single hyperbolic envelope of the limit. It means that a limit can be certified by exhibiting just two natural numbers: the start m and the scale k.
We illustrate the concept by going carefully over the 3 Exercises from the last video. Then we begin a quick review/exposition of inequalities, which are important tools when dealing with limits (and analysis more generally). Starting with inequalities for natural numbers, we progressively move to inequalities for integers, and then rational numbers. Notions of positivity are of course crucial here. We carry on with our study of the definition of a limit, concentrating on particularly pleasant and amenable kinds of sequences, associated to rational polynumbers (or rational functions) and now going to infinity. Again we use a simpler and more elegant variant on the classical definition which is well suited to this situation, and makes verifying limits into finite tasks! This is the first of two videos that will look at the official formal definition of a limit of a sequence, as initiated by Bolzano, Cauchy and Weierstrass. Although commonly regarded as a pillar of modern analysis, in fact this definition has serious logical problems. We state what these problems are, and then start to try to explain them. This lecture will involve some more complicated notions, often only introduced in introductory analysis courses at the 2nd or 3rd year undergraduate level. However by looking carefully at some examples, I hope to show you what the definition is trying to say, and then ultimately why it doesn't work. This is the second of two videos that look at the official formal definition of a limit of a sequence, as initiated by Bolzano, Cauchy and Weierstrass. Although commonly regarded as a pillar of modern analysis, in fact this definition has serious logical problems. We state what these problems are, and then start to try to explain them. In this lecture, we go beyond the baby examples usually found in calculus and analysis texts, revealing more of the typical generality and inaccessibility of a lot of the discussion of general limits. In particular we examine an extended harmonic sequence formed by playing the Collatz game (also called the 3n+1 problem, and described at some length in my video Famous Math Problems 2: The Collatz Conjecture FMP2). We will see the essential problem is that the definition actually requires us to make an infinite number of computations to assert that a general `sequence' has a limit. Is it possible to make an infinite number of computations? No, it is not. Are we allowed to pretend that we can make an infinite number of computations? Well I suppose so, but let's not call it mathematics. Built on top of this idea is the most familiar story for the `construction' of real numbers: to imagine that the limit of a Cauchy sequence of rationals can be defined to be essentially the sequence itself! The `essentially' refers to the fact that different Cauchy sequences can head in the same direction: so it means that we must introduce a complicated notion of equivalence into the story (more infinite numbers of checks, repeated an uncountably infinite number of times!). This crude and dubious attempt at pulling oneself up by one's bootstraps renders most computations with real numbers essentially vacuous. Of course this is not what current pure mathematicians want to hear! We want to believe in real numbers as Cauchy sequences, for reasons that will become clearer in the next video. There is a good reason why pure mathematicians cling so tenaciously to the idea of real numbers. They provide us with the ostensible `values' that lengths, areas, values of functions and solutions to equations seem to require. But is this all really just a dream?? In this video we have a new look at these notions, with a view of examining whether they really do support `real values', or whether perhaps they are intrinsically approximate notions. To motivate the discussion, we go back to a crucial calculation of Archimedes. Motivated by Archimedes calculation of an approximate ratio of circumference to diameter of a circle, we introduce an Archimedean view on `real numbers": nested sequences of intervals whose sizes go to zero. If you are going to waffle about the existence of real numbers, this is at least an excellent way to do it! That's because it actually corresponds to what we want to do in many applied situations: get increasingly tighter bounds on an intrinsically approximate quantity. With this introduction, we then show how Cauchy sequences are an attempt to minimize the data involved in the representation of a real number, but this is a source of one of the serious problems with the idea: a lack of any kind of control in general about how close to the `limit' we are as we go down a Cauchy sequence. Math Foundations 114: Real numbers as Cauchy sequences don't work! This longish video lays out the various reasons why Cauchy sequences---as a basis for the theory of real numbers---don't work. Necessary viewing for all maths students! We really need to start addressing the logical weaknesses, rather than pretending that they are not there! In this video we ask the question: how do standard treatments of calculus and analysis deal with the vexatious issue of defining real numbers and their supposed arithmetic?? We pull out a selection of popular Calculus and Analysis texts, and go through them with a view of finding out: what exactly is a real number? All the books I examine are excellent books---aside from their treatment of foundational issues, where we see that they mostly fall clearly short. We look at Calculus texts by Steward, Sallas Hille and Etgen, Rogawski, Courant, Spivak, Caunt, Apostol, Keisler and Adams, and Analysis texts by Spiegel, Apostol, Royden, Kolmogorov and Fomin, and Rudin. This video really should be an eye opener to students of mathematics. Yes, it is possible to challenge the standard thinking, and the mathematical world need not collapse. Admitting current weaknesses, and the lack of acknowledgement of them by the Academy, is an important step in moving forward to a newer, better mathematics. Richard Dedekind around 1870 introduced a new way of thinking about what a real number `was'. By analyzing the case of sqrt(2), he concluded that we could associated to a real number a partition of the rational numbers into two subsets A and B, where all the elements of A were less than all the elements of B, and where A had no greatest element. Such partitions are now called Dedekind cuts, and purport to give a logical and substantial foundation for the theory of real numbers. Does this actually work? Can we really create an arithmetic of real numbers this way? No and no. It does not really work. In this video we raise the difficult issues that believers like to avoid. In this video we venture into a range of topics, from the nature of the continuum, to the paradoxes of Zeno, to an understanding of some of the consequences for mathematics in the shift from geometry to arithmetic that flowed from the Cartesian revolution. As we let go of the real numbers, we must prepare ourselves to appreciate that the arithmetical view of geometry does not always exactly fit with our physical intuition. Our biology constrains us in important ways, and so guides our thinking down certain paths, for better or worse. If we demand that mathematics adheres to our biological orientation and physical intuitions, then we can be led astray. Such is the reason why modern pure mathematics has lost its way logically, with its unreasonable insistence that there is a theory of real numbers. In 1999, I wrote a paper called `Real fish, real numbers, real jobs', which appeared in the Mathematical Intelligencer. In this video, I read this paper in full. It was meant as a somewhat humorous take on an important issue. The reception of this paper is also briefly discussed; I feel this raises some interesting additional issues about the attitude that modern mathematics has towards any kind of self-criticism. I hope you enjoy this somewhat different video! The mathematics of the coming century is going to look dramatically different. Real numbers will go the way of toaster fish; claims of infinite operations and limits will be recognized as the balder dash they often are; and finite, concrete, write-downable mathematics will enter centre stage. In this overview video, we look at some of the directions that mathematics will take, once the real number dream is abandoned. You can think of this as a bird's eye view of a lot of the rest of this video series. It is an exciting time. Mathematics has not had a proper revolution; surely it is long overdue! The role of axiomatics in mathematics is a highly contentious one. Originally the term always referred to Euclid, and his use of the term to mean `a self-evident truth that requires no proof '. However in modern times the meaning of the term has shifted dramatically, to the idea that an Axiom is `a convenient fact that we assume'. This casts considerable doubt on the validity of the usual claim that `Mathematics is built on Axioms", which these days appears more and more as a religious position rather than a scientific one. Is that what we want our subject to be?? Your belief system as opposed to my belief system?? In this video we discuss this shift in meaning and its consequences when trying to set up a theory of real numbers. We will be discussing this important issue further when we get around to critiquing `modern set theory'. Here we continue explaining why the current use of `axiomatics' to try to formulate a theory of `real numbers' is fundamentally flawed. We also clarify the layered structure of the rational numbers: we have seen these several times already in prior discussion of the Stern- Brocot tree, here we view rationals in [0,1] in terms of increasing denominators. This allows us to explain why, if you believe the usual sad story of being able to `do an infinite number of operations', we can `create' nested interval sequences (or equivalently Cauchy sequences) with no rational limit. This paves the way for introducing the much vaunted ``least upper bound property'' of `real numbers', which is a mainstay of classical analysis, and props up the modern theories of areas, integrals, infinite sums, transcendental functions, infinite products, lengths of curves and much more. The reality is that much of modern mathematics, sadly, is an elaborate dream system. Here we are slowly, slowly....waking up. Feel free to join us, it's actually quite invigorating! Happy New Year everyone, and I wish you all the best for 2015! In this video we introduce some basic orientation to the problem of how we represent, and think about, space in mathematics. One key idea is the fundamental duality between the affine and projective views: two sides of the same coin. We explain how the Cartesian revolution of the 17th century built geometry from a prior theory of arithmetic: for us that of the rational numbers- of course! And we introduce some useful notations for points and proportions, and give a geometrical view of the relation between the affine line and the projective line. In this video we introduce the second most important theorem in all of mathematics (excluding the laws of arithmetic)! It is certainly remarkable that the recognition of the importance of this result (called the Triple quad formula) is only now taking place at the beginning of the 21st century. How does this formula arise? By asking the deceptively simple questions: how do we measure the separation between two points, and then what is the relation between three collinear points? In this video, at a certain point I invite you to discover this crucial formula for yourself. It is highly recommended, especially if you are a serious student of mathematics, that you spend an hour or so to deduce the required result before I tell you what it is. This occurs around 14:30 of the video. Remarkably, the Triple Quad Formula (TQF), even though it is purely a one-dimensional result, contains in it the seeds of higher dimensional results. In this video we look at a classical result from ancient Greece, called Heron's formula for the area of a triangle in terms of the side lengths, and reformulate it purely in terms of rational quantities: the quadrances of the sides, not the lengths! We call this reformulation Archimedes' theorem, since it is known from Arab sources that Archimedes had Heron's formula several hundred years before Heron did. In this video we introduce Brahmagupta's celebrated formula for the area of a cyclic quadrilateral in terms of the four sides. This is an obvious extension of Heron's formula. We are interested in finding a rational variant of it, that will be independent of a prior theory of `real numbers', `square roots' and `lengths'. For motivation we look at the situation of four affine 1-points. Is there an analog of the Triple Quad Formula? Yes there is: it is the more mysterious and complicated Quadruple Quad Formula. To get it, we will examine some important manipulations for a pair of quadratic equations which are of independent interest. This lecture has some more serious algebra in it: a great place to practice your manipulation and organizational skills. If you are teaching college mathematics, please consider doing yourself and your students a favour: teach them some of the material of this lecture carefully and explicitly! aThe classical Brahmaguptas' formula gives the area for a convex cyclic quadrilateral, in terms of the four side lengths. We want to connect this with the purely 1-dimensional result called the Quadruple Quad Formula. First we review the corresponding relation between Heron's formula and the Triple Quad Formula, resulting in what we called Archimedes theorem. An important ingredient is a modern insight of Robbins into the area of a non-convex cyclic quadrilateral, and a remarkable connection with the factorization of the Quadruple quad formula when its inputs are squares. We illustrate these ideas with explicit examples which show how superior it is to replace `real number' waffling with rational number precision. The video ends with a lovely exercise that leads to the over-arching theorem which incorporates both the formulas of Brahmagupta and Robbins. There is much to learn and be done in this video!There are three main branches of mathematics: arithmetic, geometry and algebra. This is the correct order, both in terms of importance and of historical development. Here we introduce our program for setting out foundations of algebra. The Cyclic quadrilateral quadrea (CQQ) theorem is a major re-evaluation of the classical theorem of Brahmagupta on the area of a convex cyclic quadrilateral, which combines it with Robbins much more recent formula for the corresponding area of a non-convex cyclic quadrilateral. We illustrate both these situations with explicit examples--always a good idea when faced with abstract theorizing. Then we exhibit the CQQ theorem. The discussion is continued in part b. We exhibit the CQQ theorem, and illustrate it numerically in both the convex and non-convex cases. Prepare for some fun algebra, and some deeply satisfying numerical calculations! isn't it nice to do mathematics properly?? We discuss modern developments in the direction of our latest videos, namely formulas for areas of polygons in terms of the quadrances of the sides. We discuss work of Moebius, Bowman and Robbins on the areas of cyclic pentagons. There is also a rich story about 3 dimensional generalizations of Heron's formula or Archimedes' theorem to polyhedra: going back to Tartaglia for the case of the tetrahedron, connecting with a rigidity theorem of Cauchy, a remarkable example of R. Connelly, the so-called Bellows Conjecture, and its lovely resolution by I. Sabitov. We will see throughout that it is really the quadrances of sides, not the lengths of sides, which these formulas are based on. The intrinsic algebraic aspect of this kind of geometry comes to the fore. We introduce the projective parametrization of the unit circle. This extends slightly the usual rational parametrization that we have discussed in many places, and allows a complete and coherent analysis of many aspects of circle geometry, in a context that extends pleasantly to other conics. We derive formulas for areas of triangles and quadrilaterals circumscribed by the unit circle, and also quadrances. We extend our proof of the Cyclic quadrilateral quadrea theorem to general circles in the plane. This requires us first of all to discuss general circles. This requires a bit more sophistication and care than is usually supposed: it turns out that dilations are not enough to transfer results from the unit circle to a general circle centered at the origin: we need rather to consider suitable rotation/dilations closely associated to complex numbers and their multiplicative structure. So we will introduce some basic terminology and results for the arithmetic of complex numbers; in particular we will emphasize that the quadrance of a complex number is a much more natural and fundamental notion than the `modulus'. The other famous classical theorem about cyclic quadrilaterals is due to the great Greek astronomer and mathematician, Claudius Ptolemy. Adopting a rational point of view, we need to rethink this theorem to state it in a purely algebraic way, without resort to `distances' and the corresponding infinite processes. Perhaps surprisingly, the Triple Quad Formula comes to our aid. Once we have a rational formulation of this classical result, we can understand that it applies in considerable more generality than is usually supposed. We can interpret Ptolemy's theorem over a finite field--which we here introduce in a somewhat informal way, as well as over a relativistic planar geometry in the direction introduced by Einstein, and also Lorentz and Minkowski. A wide new avenue of thought looms into view: that many classical results of Euclidean geometry, when formulated logically correctly without reference to the `completion of infinite processes', yield much more general and wide ranging results opening up many new areas of investigation! Brahmagupta's formula gives the area of a cyclic quadrilateral in terms of its four (outside) `lengths', and the CQQ theorem was a logically correct reformulation of that result, using quadrances instead of `distances'. But what about a general quadrilateral? This is a redo of last week's video, where we discuss a lovely formula for the quadrea (16 times the square of the area) of a general planar quadrilateral, in terms of its six quadrances. Thanks to various investigations by viewers, in particular relike868p, pieinth3sky, wgregor31, MisterLi and Martin Josefsson, I can now present a more accurate story of the history of this theorem. It appeared as a Problem in a 1960 American Mathematical Monthly issue, showing that at certain points this result flew under the radar. It is a lovely result that generalizes directly Archimedes theorem for the quadrea of a triangle. We also give some related more complicated formulas that generalize Brahmagupta's formula. A key point is that the truly important geometric formulas are rational ones: expressible without any dubious appeals to `infinite procedures' that cannot in fact be completed, or `real number arithmetic' that lives only in the imagination---never to be encoded on a computer. The usual idea is that length, area, volume etc are the fundamental measurements in metrical geometry. This is only true in a rather limited sense. With a wider view, we see that the squares of these quantities, suitably normalized, are invariably more general and fundamental. We have a look at this situation, starting with the one dimensional case and working up. Quadrance, quadrea and quadrume are the natural replacements which are invariant under permutations. Lengths, areas and volumes only make sense in particular dimensions, and are there oriented quantities. This prepares us for the remarkable insight that the geometric nature of linear structures depends on the dimension of the ambient space that we find them in. In particular we study the interesting fact that although the standard Euclidean affine plane does not support the idea of an exact equilateral triangle, in three dimensions we can easily find such an object. One moral to the story is not to rely overly on our physical intution, and the second is that number theory matters in geometry. In science and ordinary life, the distinction between absolute and relative measurements is very useful. It turns out that in mathematics this is also an important distinction. We must be prepared that some aspects of mathematics are more naturally measured relatively, rather than absolutely. This is very much in the spirit of the ancient Greeks, who did not impose an arbitrary measuring unit into the plane to define lengths, but preferred to consider the ratios, or proportions, formed by segments and other quantities. We will see that while signed lengths of segments are not generally defined in the plane, the proportions along any line of two segments contained in that line is well-defined. Similar considerations apply to signed areas in three dimensions etc. How do we organize metrical geometry? This video gives a broad outline of the subject---using a close parallel with how you might make a pizza. Just as there are quite a lot of different pizzas out there, so there are a lot of mathematical geometries out there, and we can try to be systematic in organizing them! Here we establish the projective analog of the (affine) Triple quad formula. This tells us the relationship between the three projective quadrances formed by three projective 1-points. It is surprisingly similar to the Triple quad formula, but there is an important cubic twist! This formula is one of the really key formulas in mathematics. It's influence will, one day, extend far and wide. In Rational Trigonometry, the same formula goes by the name of the Triple spread formula--the two formulas are exactly the same, although the contexts are somewhat different. In this video we look at some pleasant consequences of imposing a Euclidean structure on the projective line. We give a proof of the fundamental projective Triple quad formula, talk about the equal p-quadrances theorem, and see how the logistic map of chaos theory makes its appearance as the second Spread polynomial. We also introduce rotations and reflections in this one-dimensional situation, and see how the composition of rotations naturally leads to an algebraic structure on the projective line. This multiplication is a one-dimensional version of complex number multiplication. The projective line can be given a Euclidean structure, just as the affine line can, but it is a bit more complicated. The algebraic structure of this projective line supports some symmetries. Symmetry in mathematics is often most efficiently encoded with the idea of a group--a technical term referring to the way symmetries can be composed to generate new symmetries, satisfying certain properties. Here we look at two kinds of symmetries called isometries which preserve the Euclidean structure: rotations and reflections (it turns out these are the only types of isometries in this context). We derive algebraic relationships between these isometries. This is a nice introduction to Group Theory, rather explicit and concrete--which of course is the best way to learn about abstract objects! In this video we show that the algebraic approach to the metrical structure of the projective line, including the group of isometries including rotations and reflections, can all be defined and studied over a finite field. This is quite a remarkable fact. It leads us to think that perhaps much of Euclidean geometry has a valid interpretation in such a finite setting---and in fact this turns out to be the case. This new meeting ground of traditional geometry and a concrete combinatorial domain will inevitably lead to many new avenues of investigation: in particular we can now count things, since there always a finite number of objects around! Here we look at the field F3 with three elements and the field F5 with five elements. It turns out that there are significant differences between these two cases, and in fact we discover aspects of Euclidean geometry that are invisible over the much more familiar setting of the rational numbers, and that connect naturally with the relativistic geometry of Lorentz, Einstein and Minkowski. In fact this finite Euclidean geometry is a good introduction to relativistic thinking! We extend our discussion of elementary metrical projective geometry in one dimension to incorporate Einstein's special theory of relativity. This remarkable new understanding of Einstein transformed much of 20th century physics, but its effect on pure mathematics has been surprisingly modest. In this video we see that even in the one dimensional setting, relativistic geometry, also associated with the names of Lorentz and Minkowski, is a rich alternative framework. This is a useful introduction for physicists to a geometry that figures very prominently in modern physics. One of the key new features is the existence of null points, which are analogous to the situation that we met over F_5 in our previous lecture on the Euclidean setting, and which correspond to the space-time trajectories of photons. This video is an introduction to a fascinating new world of geometry, much bigger than the one we usually thing about. A key feature is that we are required to think more algebraically, and let go of that real number dreaming that currently distorts our geometrical understanding. There are three planar metrical geometries that fit together beautifully; the usual Euclidean geometry (which we call blue), and two relativistic geometries (red and green). Most of the fundamental theorems of the subject hold for all three. But even more remarkably, when we transcend Klein's Erlangen program and consider all three geometries simultaneously, many completely new and unexpected relations and patterns appear. This is a key door into 21st century geometry. Hundreds of fascinating discoveries await those who venture forth and learn how to think about geometry in this bigger, richer way. It also provides a lot of evidence to support the purely algebraic, logical point of view that results from letting go of the `real number' dreaming! The fundamental new law for relativitistic velocity addition introduced by Einstein in his theory of special relativity is closely connected to the idea of projective quadrance, but with respect to the red planar geometry. Velocity is a projective quantity and relativistic rotation in the red setting is just what we need to explain this Einstein velocity addition. We introduce an important variant to the unit circle---what we call the core circle, which has diameter the unit interval [0,1]. For understanding the projective line, this core circle is a very useful object, and forms a bridge from projective geometry to Euclidean planar geometry. Here we establish some basic facts and formulas for this object, and show how quadrances between points on the core circle exactly agree with projective quadrances between the corresponding projective 1-points. We also find a pleasant formula for the quadrea of a triangle on the core circle. We introduce Paul Miller's protractor-- a nice way of using the core circle to quickly and efficiently read off spreads or projective quadrances between lines. This really highlights what a useful link the core circle is---between projective measurements and affine ones. We are slowly moving out of "dot dot dot" land here, towards a more rational, logical and powerful formulation of mathematics. We show how to extend Paul Miller's protractor to easily read off the projective quadrance between any two projective points, using the core circle. Then we show how these ideas extend to the red relativistic setting. There is there also a core circle, with equation x^2-y^2=x which plays an analogous role as did the core circle in Euclidean (blue) geometry. We also discuss the Parallel chords theorem, and give geometrical interpretations of rotations or Lorentz boosts which highlights the symmetry between these different kinds of geometry. When we let go of angles, transcendental circular or hyperbolic functions and dreamings of `real numbers', we get algebraic insights that let us see things in a more more general and powerful light. This video looks at the projective Triple quad formula, also known as the Triple spread formula in Rational Trigonometry, and how it relates to curvature. A triangle in the plane has a unique circle through the three points, called the circumcircle of that triangle, and a fundamental question is how to determine the size (for us, quadrance) of that circle from the three side quadrances of the triangle. The formula has a lovely connection with both the fundamental Triple quad formula and the projective version of it. Quadratic curvature is defined to be the reciprocal of circumquadrance. Understanding the relation between projective 1-points and the core circle is key to how the projective triple quad formula connects one dimensional and two dimensional geometries. In this video we use the relation between the circumquadrance of a circle, and the quadrances and quadrea of a triangle circumscribed in that circle to derive a classical formula for the curvature of the standard parabola y=x^2. The method is quite general, and applies to a wide variety of algebraic curves. This gives a completely algebraic alternative to the definition and calculation of curvature in the planar situation, at least for such kinds of curves. Note that what we get is actually the quadratic curvature-- the square of the usual curvature. In this video we introduce the projective version of the Quadruple quad formula, which not only controls the relationship between four projective points, but has a surprising connection with the geometry of the cyclic quadrilateral. The projective quadruple quad function is called R(a,b,c,d) and it is a more sophisticated variant of the quadruple quad function Q(a,b,c,d) which figures in the one-dimensional affine situation when relating 4 points. This is part of a large scale replacement of the usual classical trigonometry involving angles to a more general and powerful approach to metrical geometry which works over general fields and with arbitrary bilinear forms. Around 1400, the mathematician Parameshvara from the southern Indian state of Kerala discovered a remarkable formula in the spirit of Brahmagupta, but which gives the circumradius of a cyclic quadrilateral in terms of the four lengths of sides, at least if the quadrilateral is convex. In this video we bring together Parameshvara's result and a corresponding formula for the non-convex case in a new algebraic formulation that avoids all mention of transcendental quantities such as length. We get in fact a quadratic formula, part of Rational Trigonometry as laid out by the author's book Divine Proportions: Rational Trigonometry to Universal Geometry (Wild Egg Books). A major theme in the last dozen or so videos is that there are rational alternatives to the usual `real number formulations' of many classical results. These rational reformulations often look quite different, and turn out to be more general and powerful, allowing us to make complete calculations without appeal to infinite processes that we cannot actually complete, or symbolic squiggles to represent them. They also allow us to extend our geometrical understanding to other fields, for example finite fields, and to other geometries, for example the red relativistic geometry of Einstein, Lorentz and Minkowski. So all is not lost when we start thinking correctly about modern mathematics--in fact quite the opposite: we start to discover new and better ways of understanding!